Today’s seniors are living longer, fuller lives and it is becoming more relevant as to why technology in a Senior Living Community matters. They, and their families, are looking for housing options that match their wants and needs. Seniors want to live as independently as possible, but have the option of help if they need it. Senior living communities are seen more and more as the perfect solution to have help standing by, as well as the social opportunities that come from such a community. Technology is a big part of how the senior lifestyle is changing. 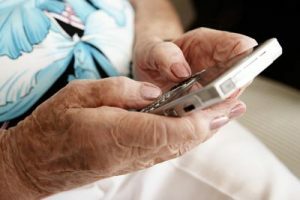 According to recent research data, almost 60% of today’s seniors go online, and nearly 80% have a cell phone. Even though seniors have been a little slow to jump on the technology bandwagon, their tech savvy continues to grow. As a matter of fact, state-of-the-art technology services are starting to become a prerequisite when seniors and their families are evaluating housing choices. With technology now being a requirement, communities are being upgraded and built with that in mind. For a newer community, including technology is a given. One way communities are catering to today’s seniors is by making sure Wi-Fi is available. Technology is not just for leisure. Many senior communities are incorporating advanced technology to improve efficiency and provide a safer environment for their residents. For instance, some skilled nursing communities are using sensory patches that can monitor how often a person turns while they are sleeping. This helps caregivers to determine when assistance may be needed during the night. Technology can track caregivers and determine response time when a resident calls for help. It can also monitor who goes in and out of the room. In many places, this technology can be used to monitor a resident’s medication schedule. When a caregiver gives a resident their medication, they can enter the time the medicine was given into the database so the person on the next shift knows when to give the next dose. An example of our technology would be the R-Care System we use. R-Care is a provider of tested wireless nurse call and personal emergency response systems for the entire spectrum of senior living. R-Care components integrate into a variety of healthcare communication systems to create verifiable and efficient responses to medical emergencies. R-Care works with a distribution partner to build and individualized and flexible system to enhance caregiving and quality of life. We are proud to say that we are the only community in the area that offers such technology. Technology plays a very important role in how we care for the health and safety of our residents here at Stillwater Senor Living. To find out more about our community and how we use technology to care for our seniors, CONTACT US TODAY for more information and to schedule a tour of our beautiful state-of-the-art community.